And then they go and do something more silly than any dog could ever dream up. And they look even sillier than a dog because, deep down, they’re crying out in shame. And that’s what makes it funny! 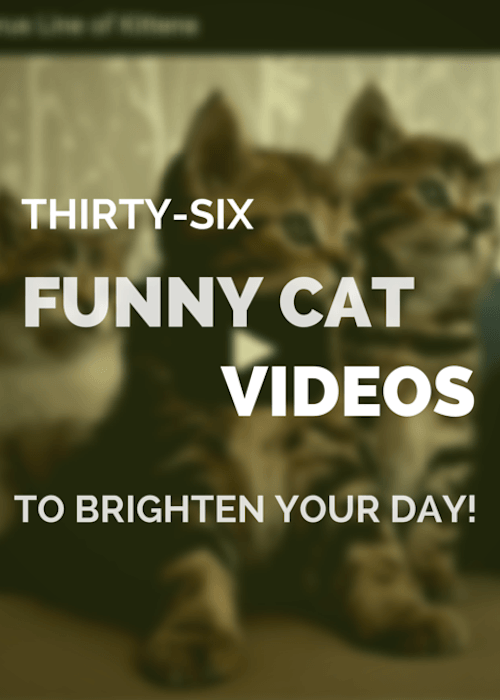 Here are 36 funny cat videos to brighten your day! Share with a friend who needs some cheering up! Face plant sleeping! How does she even breathe! Don’t try this at home, kitties! Cuteness overload! Here, the most patient cat ever is smothered by baby’s affection. Will the cat snap? Watch to find out. How dare someone interrupt this cat while he’s watching TV! Total death stare. A teenager, for sure. I think the joke’s on the dog in this one! Perfect example of how unfunny cats can be (which makes it funny!). Watch this cat talk! This short film gives Milo and Otis a run for its money. Such perfect translation from cat to English. Does that make it ‘catlish’? Very. Angry. This precious creature does not appreciate being locked up in a cage. But would you? Tough job, being a vet or a vet nurse. Much tougher when the cat is Attila the Hun in cat form! “Friends don’t bite their friend’s ears when sharing a meal,” according to Cat. This kitty thought life was all about food. Not so! Bath time had other plans for him. Comedy gold right here! And there’s always one who likes to be different on stage, isn’t there? We all know cats are cool, but not all cats are this cool. Drop the bass kitty. Who’s the angriest cat of them all? Watch this cat fighting with his own reflection! Scary stuff! It just feels so goooood to sing! Sing it kitty, sing it! Scratch there? No, here? Ahhh. Now sing! It’s time to get fit! Let’s go! Right paw up. Right paw down. Right paw up! Right paw down. Now both up! Feels good doesn’t it? Get ready to tumble! This professional cat fight will have you biting your nails until the last minute. Who will you root for? Who will win? 17. Kitten Afraid Of Mouse? What else would a big brave cat do when it sees a mouse, but jump up on a chair? Hey, give the kitten a break. We humans do it too! omg gf did u c tom in the garden 2day? he is soooo fine! i totes must jump on him 2moro. he’s gr8. LYLAS! Can’t win them all, apparently, no matter how athletic you think you are. Life is tough for a snow cat. “Winter Is Coming” are three words cats never want to hear. Wait! Who cares about the cold? This is fun! Endless fun! When do we get to build a SnowCat?!?! Dude, what’s your issue? There’s a special place in the world for every cat. It’s important we accept them into our hearts and homes no matter how completely, absolutely, utterly crazy they may be. Anyone got a spare cat straight jacket? Here he was, enjoying a perfectly nice rest on the bed when … ARGH!!! Oh us humans like to tease, don’t we? What did the toilet paper ever do to you, Cat? Also, did anyone else spot that creepy black cat. What the … ? 24. Jump! Go ahead And Jump! You might as well jump! A child, a cat and a trampoline. What a wonderful way to fill your weekend! I think every cat, from here on in, deserves a balloon on their birthday. Alternatively, if you’re looking for someone to tidy up the balloons after your party, this cat’s your guy. 27. Bring That Beat Cat! This cat’s rockin’ it with the best of them. Move over Dave Grohl. This cat’s coming to a town near you! Remember that cat from the snow earlier? Well … Here’s an easier jump he tries to attempt. Sigh. There is absolutely no need to shop for cat toys, is there? Hours of fun for the whole cat family with this simple cardboard cat playtoy. This cat’s got a serious drinking problem. Trying to conceal it in plastic or paper bags won’t hide it kitty. Off to CA (Cataholics Anonymous) stat! I have no idea how this cat gets out of the vase, but it got in so – you know – I guess we just have to have faith! Just don’t try to water her in case she grows! Get this kitty off to a ball game! Before you get your knickers in a knot, this isn’t actually real. That would count as cat abuse. They do get mesmerised by fans, though! Oh the ghastly shame of it all! How on earth did those cats wake up the next morning with that same look of superiority? I’d say they gave it a red hot go. Lover of cats? Keen to remember every cute, silly, adorable thing they do? Be sure to take a look at our pet paw canvas for sale online now in our Silhouette collection.